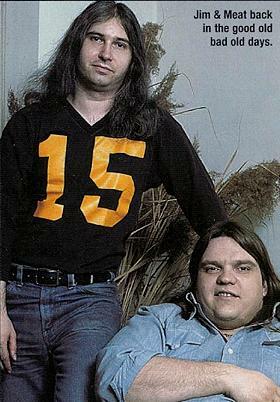 It launched Meat Loaf onto an unsuspecting world. It stayed in the UK charts for eight years and became the biggest selling debut album of all time. It also nearly finished off the singer for good. Now CLASSIC ROCK brings you the astonishing story of "Bat Out Of Hell." Meeting Jim Steinman, the creator of Bat Out Of Hell, was a memorable experience. After enjoying years of vicarious thrills from his widescreen, Technicolor songs - songs that accompanied me and a million others through teenage fumblings and sweatily unpleasant hormonal surges - the real thing was no disappointment. He shook hands with a soft, pudgy mitt that had never see a day's work; long, tapered fingernails and girlishly manicured nails. He had a huge rush of totally grey hair, a slobby unexercised body, a rounded moon-face that had rarely seen the daylight and voice like that of the cartoon character, The Hooded Claw. He wore and expensive leather biker's jacket on which naked women had been wonkily painted. We were at Pinewood Studios in Buckinghamshire, where he was supervising a video for the track "It's All Coming Back To Me Now", the first single from his Pandora's Box project. The director was perhaps the only man in the world who could match Steinman in the scope of his creative vision, Ken Russell. And even Russell, by now a ruddy-faced, well-lived sixty-something with Tommy, The Devils and Whore on his CV and years of working with Alan Bates and Ollie Reed under his expansive belt, seemed to be feeding off the kinetic blast of Steinman's particular madness. The video script, such as it was, called for singer Elaine Caswell to be sexually aroused by a large python and writhing on a bed that lit up in time with the music, while surrounded by a group of bemused, semi-naked dancers on a day-trip for their regular gig in Cats. The two day shoot was over running badly, and the cost of continuing was 35,000 Pounds an hour. Steinman casually offer to pay himself, and Russell nodded back and grinned. They were having a fun time, and over lunch they were plotting an unscripted climax to the video, one that would come as a shock to Virgin Records, who were nominally the clients. Steinman demanded - and Russell wholeheartedly agreed - that the only fitting end to the cut was for a man to ride a motorcycle up the steps of a local church-tower known to Russell, jump it out of the turrets at the top, and then explode. To the surprise of only two men - Jim and Ken - the wardens of the 500-year-old church refused. But that was Jim captured perfectly in his moment: you start off by thinking big, and then you take it from there. We met twice more over the next few days, and he proved a fascinating and complex man. He was obsessed with motorcycles, and yet he hadn't passed his driving test. The characters in his songs were heroic figures, beautiful, fragile and doomed, but he was a bachelor who lived a solitary life on a remote farm. When we went to dinner, he ordered everything - literally everything - on the menu and then ate a bit of each. Aside from music, his great love was fine wine, and one of his managers told me that he wrote about every wine that he tasted in the same way he wrote his songs. "If it was published," he said, "it would be the greatest book on wine ever written..."
Above all, spending a little time with Jim Steinman proffered an insight into how someone could write a record as unique, as mad, as special, as crazy and as dumb and overblown as "Bat Out Of Hell", still the biggest selling debut album ever released, and as of now, the third biggest-selling record of all-time. As the saying goes, it's always the quiet ones that you've got to watch. 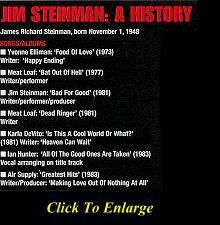 A classmate of Jim Steinman's once said: "Jim knew what it meant to be cool and he knew that he wasn't." Instead, the odd-looking kid who spent much of his time "imagining I had a bat perched on my shoulder" created in his head a place for the kind of man he knew he'd never be: a land for the heroic. Now he just had to convince the rest of the world. Elsewhere in the country, under the endless skies of Texas, a class fat-kid, a big, big boy with a big personality felt a stirring too. In a scene straight from a Steinman song, he became so distraught at his mother's funeral that he grabbed her body and screamed at the undertakers, "You can't have her!" Shortly afterwards, his alcoholic father tried to kill him. Of course, this left its mark on Marvin Lee Aday, who had, since Junior High, been known as Meat Loaf, and merely Meat to his friends. Meat Loaf was the kind of guy you notice, the kind of guy stuff happens to, and his path from Texas to New York was a colorful one. Aside from a walk-on part at the assassination of JFK and a job on a turkey farm, he was in and out of bands and drawn to the stage. His first success of note came when he nailed a role in the quintessential 60s wig-out nudie musical, Hair. 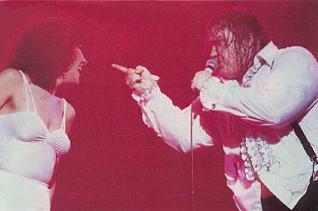 Jim Steinman, miniature bat-man, saw his future on the stage too. What made and continues to make him unique - among rock music writers is that his writing was and is not influenced by blues or jazz, or even rock 'n' roll. Instead, its roots are in classical composition based at the piano rather than the guitar. All Jim Steinman drew from rock music was its sense of wildness, of rebellion and its vast scale. He was quick to meld those values onto his regressive obsessions with teenage longings and lust, and his desire not to just write songs, but to create a parallel universe in which he could live. "I never really saw classical music and rock 'n' roll as different. I still don't," he told me. "I grew up liking extremes in music - big gothic textures. I never have much regard for more subtle stuff. Dire Straits may be good, but it just doesn't do it for me. I was attracted to William Blake, Hieronymus Bosch, I couldn't see the point in writing songs about ordinary, real-life stuff." He wrote several lengthy stage pieces: The Dream Engine, More Than You Deserve and Neverland. The first of these, completed while Steinman attended an exclusive New York State college, the private and secretive Amherst. While his academic results were suitably atrocious, Steinman was 'discovered' by the entrepreneur Robert Stigwood, who signed him to a deal with RSO (and for whom Steinman contributed the song "Happy Ending" for Yvonne Elimann), and then 'rediscovered' by the legendary Joseph Papp, who became so excited by The Dream Engine that he bought the rights to the show during the intermission of the college performance. Papp hoped to launch Steinman on Broadway with the show, but was stymied by its explicit sexual content. Instead it had a brief run in Washington DC with Richard Gere in the lead role. "Gere has one of the great rock 'n' roll voices, which he won't use, because he feels people won't accept him as an actor if he sings." Papp kept faith with Steinman, engaging him in a number of projects, including the 1971 Shakespeare in the Park Festival in New York's Central Park. Steinman had began work on More Than You Deserve with the off-Broadway lyricist Michael Weller. By happy chance, the big guy from Texas had just hit New York, too, hot from a run in The Rocky Horror Show and looking for work.